This "L" shaped computer desk will be a stunning focal point in your contemporary home office. This simple and stylish piece features thick panels and clean lines, in a dark taupe wood-look finish. The desk portion offers a spacious work surface that is great for doing paperwork or working on your computer. It also features two medium storage drawers and a convenient lateral file drawer below to help keep you organized. The secondary surface offers additional work space with extra adjustable shelves that can be used for a printer, books, and files. The silver coloured handles and feet boldly accent the piece making it a must-have for any home or office space. i3 Plus by Bestar has been created to adapt to your living space with the flexibility of its configuration possibilities. Its sleek design is Intelligent, Inspiring and Innovative. Durable 1 inch commercial grade work surface with melamine finish that resists scratches, stains and wear. The electric mechanism allows you to quickly and quietly adjust the height of the table from 28 inch to 45 inch. The control button is located on the front edge of the work surface for an easy access. It features one utility drawer, one file drawer with letter/legal filing system and five open storage compartments. Drawers on ball-bearing slides for smooth and quiet operation. Drawers are lockable. Fully reversible unit. Meets or exceeds ANSI/BIFMA performance standards. Overall dimensions : 71.1 inch x 65.8 inch x 28 inch to 45 inch. Credenza : 71.1 inch x 18.2 inch x 28.5 inch. Height adjustable table : 47.6 inch x 24 inch x 28 inch to 45 inch. i3 Plus by Bestar has been created to adapt to your living space with the flexibility of its configuration possibilities. Its sleek design is Intelligent, Inspiring and Innovative. Durable 1 inch commercial grade work surface with melamine finish that resists scratches, stains and wear. It features one utility drawer, one file drawer with letter/legal filing system and five open storage compartments. Drawers on ball-bearing slides for smooth and quiet operation. Drawers are lockable. The hutch has one fix shelf covered by frosted glass doors. Fully reversible unit. Meets or exceeds ANSI/BIFMA performance standards. i3 Plus by Bestar has been created to adapt to your living space with the flexibility of its configuration possibilities. Its sleek design is Intelligent, Inspiring and Innovative. Durable 1 inch commercial grade work surface with melamine finish that resists scratches, stains and wear. It features one utility drawer, one file drawer with letter/legal filing system and five open storage compartments. Drawers on ball-bearing slides for smooth and quiet operation. Drawers are lockable. Fully reversible unit. Meets or exceeds ANSI/BIFMA performance standards. 60-inch L Adjustable L-Shaped Desk with Storage in Dark Taupe This "L" shaped computer desk will be a stunning focal point in your contemporary home office. This simple and stylish piece features thick panels and clean lines, in a dark taupe wood-look finish. The desk portion offers a spacious work surface that is great for doing paperwork or working on your computer. It also features two medium storage drawers and a convenient lateral file drawer below to help keep you organized. The secondary surface offers additional work space with extra adjustable shelves that can be used for a printer, books, and files. The silver coloured handles and feet boldly accent the piece making it a must-have for any home or office space. 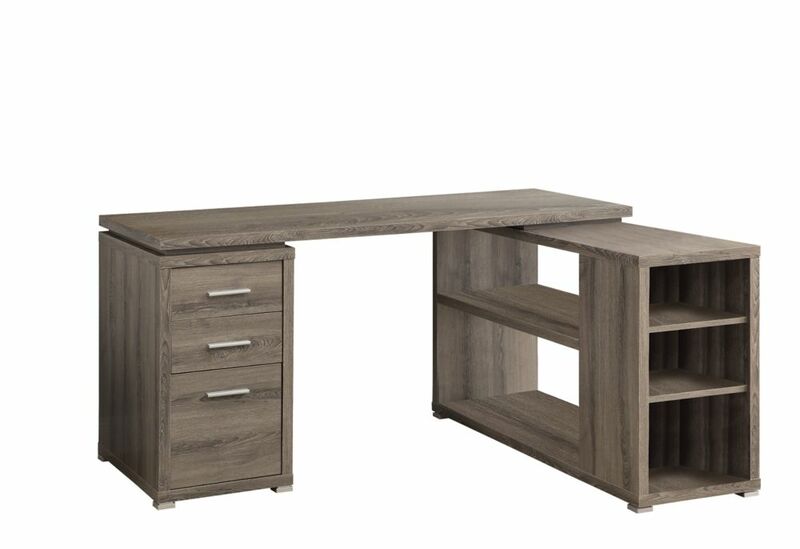 60-inch L Adjustable L-Shaped Desk with Storage in Dark Taupe is rated 4.3 out of 5 by 19. Rated 5 out of 5 by alexcait from Sturdy, holds a lot of weight, and looks great in... Sturdy, holds a lot of weight, and looks great in our new office. Rated 5 out of 5 by Lesley from Beautiful desk, went together easily, wonderfully priced.... Beautiful desk, went together easily, wonderfully priced. Rated 5 out of 5 by Linda from I just love my new desk We purchased this desk for our computer room and it looks so nice. Extremely happy with our purchase. Love the colour. Rated 3 out of 5 by Scott from There were SO many pieces to this desk I about... There were SO many pieces to this desk I about fainted when I came home & found them all over the floor & my husband in the midst of assembling this desk. It does look nice now that it’s done & seems pretty sturdy for the price. Rated 5 out of 5 by Kirsten from I love my new desk! It delivered a day early,... I love my new desk! It delivered a day early, was easy to assemble and looks amazing! Rated 5 out of 5 by Mella from nice desk Bought this for my husband as his gaming desk. He is at his desk daily playing his console games and pc and this desk is the perfect size. Storage is decent for his controllers and what not. Had a decent amount of hardware but was fairly simple to put together, only took me a couple hours (which was kind of a bummer cause I enjoy putting stuff together). It goes nicely with my living room and feels very sturdy. Rated 5 out of 5 by witchypoo from Very nice desk. Took time to assemble but not difficult. Well worth the price. Very nice desk. Took time to assemble but not difficult. Well worth the price. Here are the individual dimensions for the desk &amp; the return - Desk: 60&quot;Lx23.75&quot;Dx29.5&quot;H; Return: 47.25&quot;Lx15.5&quot;Dx27.5&quot;H. The long shelves in the back are adjustable, as are the front shelves, so the height will vary. The detailed dimensions can be viewed on the line art: http://monarchspec.com/PRODUCT_PHOTOS/LINEART_DRAWING/I 7319.jpg. We hope that helps. The two sides can be put on either side because they have the same assembly option. So you can put the long piece on either the right or left.